Blue Raster announces the launch of Eyes on Syria for Amnesty International, the world’s largest human rights organization. Created using ArcGIS Server Flex API, Flickr, and YouTube, this application tracks human rights concerns within Syria, the harassment of pro-reform Syrians abroad, and activism of Amnesty International supporters around the world. 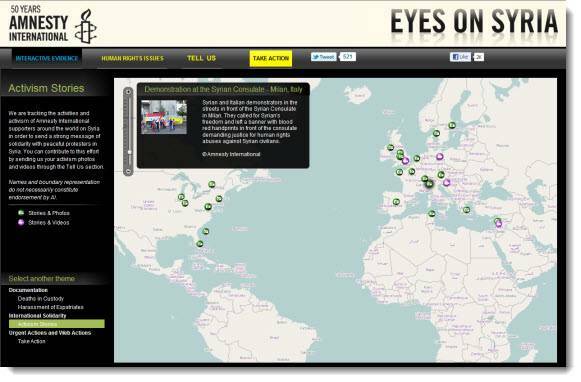 Eyes on Syria offers a comprehensive picture of the situation in and outside Syria using geolocated photography and video evidence with eyewitness testimonies as well as activist campaign materials. The project was led by Amnesty International’s Science for Human Rights Program.